In 1928 Hamilton introduced the Piping Rock - one of Hamilton's most popular models. It was originally produced through 1935 with a 6/0 sized, 19 jewel 979 movement. 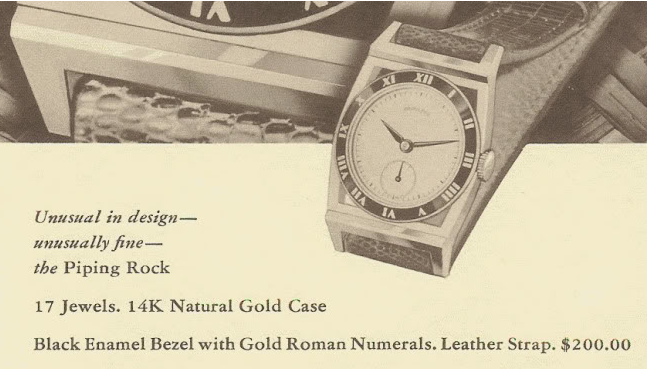 The solid 14 gold case came in yellow or white gold and had flexible lugs. The dial only has a minute track and sub-seconds register. The roman numerals for the hour markers were defined by a black enamel band applied directly to the case. One of the most interesting aspects of the Piping Rock is it was given out to the 1928 World Series Champion New York Yankees. Back in the day players would get watches instead of rings. Each watch was engraved on the side opposite the crown with the name of each recipient. Considering the 1928 team had the likes of Babe Ruth and Lou Gehrig, these watches command a huge premium. After a long period of unavailability, the Piping Rock was re-introduced in 1948. This time with an 8/0 sized, 17 jewel 747 under the hood. The 14K gold case was very similar to the original but the flexible lugs were redesigned so they were more angular and sturdier. If you look closely, you will also note other design changes, like pointex-syle hands and a recessed crown. The watch was very popular and continued to be produced until 1954. Finally, in the 1990's Hamilton reintroduced a Yankees version of the Piping Rock in an 18K plated stainless steel case. The watch came with either a 17 jewel mechanical movement or with a quartz movement. Like the original, the dial is fairly plain and the roman numeral hour markers are part of the case. The markers are so shiny that often the watch looks like it has just a black band unless the light strikes the case so the numerals reflect the light. 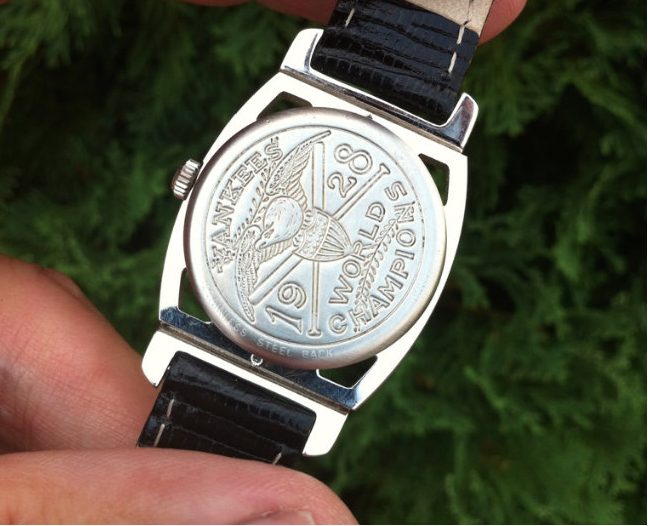 The modern Yankees version also featured an engraved case back to match the special 1928 New York Yankees watches. You will also find a "registered edition" of the Piping Rock with a plain back and quartz-driven movement. 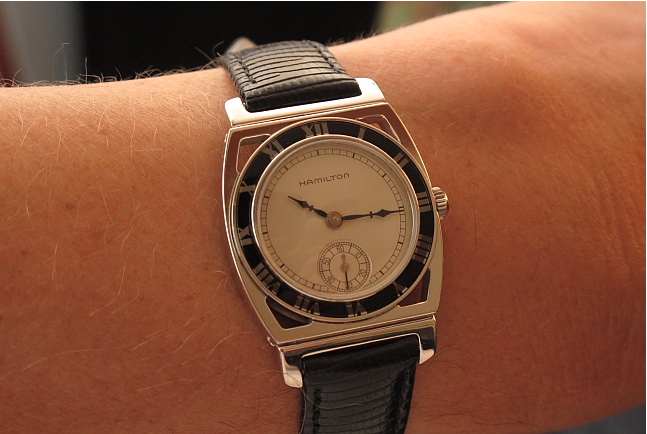 Would you say buying the Hamilton Piping Rock with the quartz driven movement is worth it? And how much do you think they cost on average? It depends. Most collectors turn up their noses at quartz movements. From a maintenance and accuracy standpoint however, they are tough to beat. I guess the magic of mechanics is what makes non-quartz watches so alluring. But from an aesthetic standpoint, if you like the look of the Piping Rock then the quartz version is the least expensive. I think $250, give or take $50 is the range they typically go for. I saw one sell for over $800 not too long ago - that was ridiculously high. The mechanical reissue is the better choice, in my opinion. Depending on condition it's a $500+ watch but it can be had for less if you are patient. How can you tell if it is quartz or mechanical? is a careful, gentle way to open up the back? Thanks for your expertise! The easiest way is to put it up to your ear. A mechanical version will be ticking 6 times per second... tick tick tick tick. While a quartz version will be silent or may have a very quiet tick once per second. The mechanical version is only in the New York Yankees reissue though - so if it has a "registered edition" case back you know its quartz. Of course, you can also pop the back cover off and look. Registered Edition watches are 1980's and 1990's remakes inspired by original vintage watches. So your Piping Rock is realistically more of a early 1990's watch, believe it or not. There are several different registered editions with quartz (battery powered) and mechanical movements. Quartz movements tend to be fairly inexpensive so $250 seems a bit high to me. You're better off contacting a watchmaker directly, rather than going to a jeweler unless they have a watchmaker on site. You could try a new battery and see if that does the trick. Have you ever seen a "Spur"? Looks a lot like the Piping Rock. I'm familiar with the Spur but haven't had one. It's a very small watch and wasn't too popular. There aren't as many of them as the Piping Rock. The PR has a very similar enamel bezel and dial as well as the same movement but that's about all it has it common with the Spur. What year did hamilton make their first men's wristwatch? This was an early one but not the first by hamilton. What was it called? Look at the 1920's models in the menu in the above, right and you'll find your answer. I recently found my grandfather's original white gold piping rock watch with a bracelet band. It definite vintage because there is an inscription on the back from 1931. It's missing the stem but I'd like to get it repaired. Would it be best to send it to Hamilton or find a watch repair? Hamilton now longer supports watches that old. Any competent watchmaker can handle I for you though. Contact me through Etsy or by email and I'll give you some recommendations. I have two of these and There is no serial # on them. Would you know where to find the serial # for them? You have two registered edition Piping Rocks? They may not have a unique serial number. They might have a model number inside the back cover but that's about it. I have a Hamilton Piping Rock, a limited edition of 199 pieces, reproduction of a 1929 model, manual winding, red gold finish and black dial. I would like to know the current value. The best way to see what it's worth is to look up sold listings on eBay. That will at least get you in the neighborhood.